This condominium resort is the most scenic place to play on Kauai, thanks to eight courts terraced into a tropical hillside above Hanalei Bay on the North Shore. Peter Burwash International's Mary Dang-Hannsz, who prior to coming to Hawaii had run a tennis school for kids in Austin, Texas. Originally from Orange County, California, where she played high school tennis, Hannsz went on to pursue degrees in Marketing and International Business, at the Fashion Institute of Design and Pepperdine University respectively. Originally her career took her to Los Angeles and then Oahu working in the film industry doing production, assisting directors, and taking on stunt work. She came back to tennis after moving to Austin, then joined Hanalei Bay in 2012 as head pro. 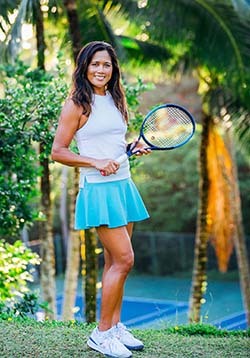 Certified by the USPTA and in USTA Cardio, she offers a diverse roster of weekly activities, including clinics, Cardio tennis, and a variety of junior programs. She also runs a Sunday round-robin and organized doubles play another three days a week. Courts & Fees. Hanalei's court complex under went a major upgrade in 2015. Four of the courts were converted to Nova Pro Court XP synthetic grass. These have a sand infill which speeds the recovery after a rain (and the North Shore did not get to be so lush without experiencing rain). The other four courts were resurfaced in blue and green DecoTurf II, the same surface used at the U.S. Open. Fees: There is no charge for court use. Beach. The resort sits up on a bluff, which furnishes it with fabulous views but requires beach enthusiasts to walk a winding pathway down to the public beach or catch the occasional hotel shuttle. Seasons. Year-round. Surf in the bay is highest during the winter months. General Tourist Information. Visit the Kauai Visitors Bureau website or contact them at 4334 Rice Street, Suite 101, Lihue, HI 96766. Phone: 800-262-1400. For information about Hawaii as a whole, visit the Hawaii Visitors Bureau website or contact them at 2270 Kalakaua Ave., Suite 801, Honolulu, HI 96815. Phone: 800-464-2924.